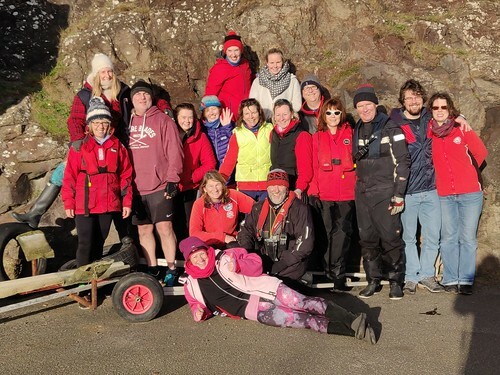 We are a rowing club involved in recreational and competitive rowing and are a member of the Scottish Coastal Rowing Association which has grown rapidly since 2009 with many clubs around Scotland and across the World. 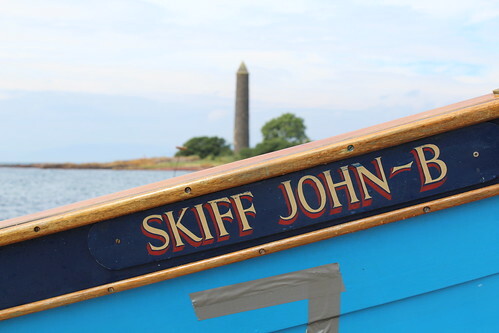 Most of our rowing is done in the St Ayles Skiff which is a seaworthy, clinker built, fixed seat rowing boat, for four rowers and a cox. We have three of these which were built, and are maintained, by members of the club. 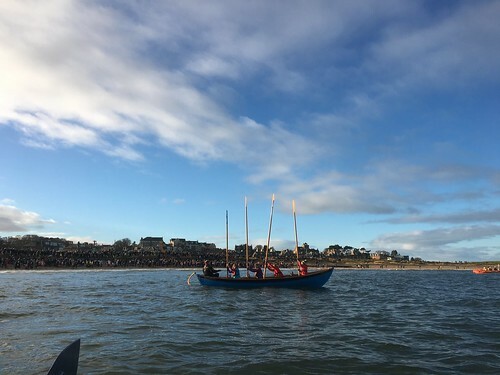 We offer local on-water activities to suit a variety of preferences, ranging from race training to pleasure and social rowing. 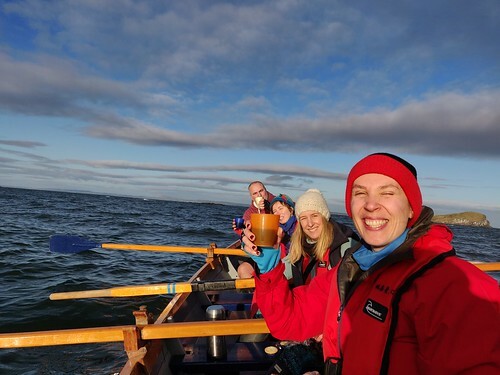 Members also enjoy opportunities to participate in regattas and other events throughout Scotland and occasionally further afield. We construct and maintain our own boats and equipment; membership will afford you access to skilled amateurs who can teach you rewarding boat building and maintenance skills. 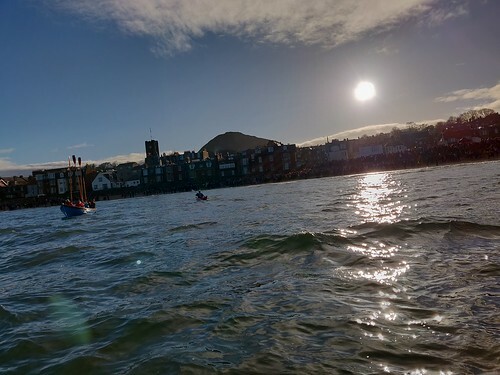 We are committed to maintaining the highest standards of competence and safety in coastal rowing; members are encouraged to develop valuable skills in boat handling and seamanship and continue the rich nautical heritage of North Berwick. Seeing in the New Year! What would you rather be doing at midday on New year's day? The chosen few donned extra layers, launched all three skiffs ( very impressed with new combo) and set off in a bit of a swell to warm up before the dookers dooked. We headed upwind towards the Lamb before surfing back into the bay to lay anchor and await the rebels....mulled wine and mince pies on the out going tide, then with midday fast approaching the count down began. I always find this emotional....takes me back to the chimneys coming down at Cockenzie. The splashing as the hundreds took to the water with the sun in the background was an amazing sight, and extremely vocal as well...the odd few, well not that odd, made it out to wish us happy new year, with the RNLI casting an eye over the proceedings. We were proud to be part of this amazing community and it's very special landscape and people. 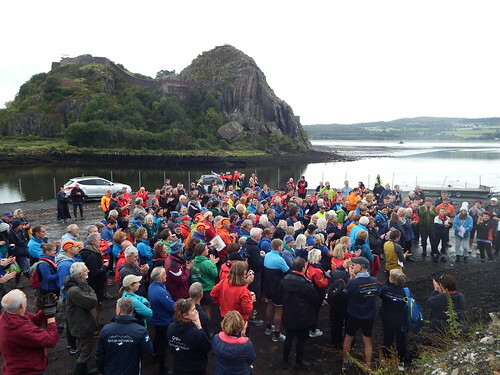 Five North Berwick crews travelled to the River Clyde for the second edition of the 13 mile race from Dumbarton Castle to the Finnieston Crane. 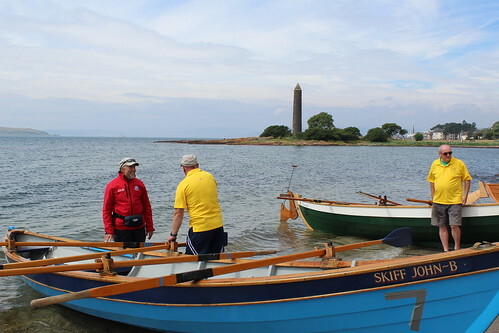 Sixty St Ayles skiffs were joined by twelve other rowing boats of various classes in the biggest event for seagoing rowers, in Scotland. The morning started at Sandpoint Marina, Dumbarton. With over 300 skiffies arriving in time to speak to friends, inspect the opposition and generally have a laugh with people of a similar persuasion. So after briefings, launching and staggered starts we all set off for the long pull towards the city. On a fairly benign day and flat calm water we expected an easier time than what could have otherwise been. And so it was in the early stage with the incoming tide pushing us all up the river towards the Erskine Bridge. The early starts got full advantage of these conditions and the Teifi skiffs disappeared into the horizon and ‘Speedwell’ (Steve Thomson/Dave Davidson/Jacque Turner) arriving first at the crane in the second fastest time of the day (1hr57mins) followed by ‘Flossie’ (Laura Cram/Louise Presslie/Kirsty Cram). The St Ayles race within a race was perhaps the most interesting competition of the day with various male, female and mixed crews of different abilities leaving at staggered times. It is certain everybody was trying to catch the boat in front of them and keep the one behind at a distance. For some this was successful while others took a more leisurely approach. 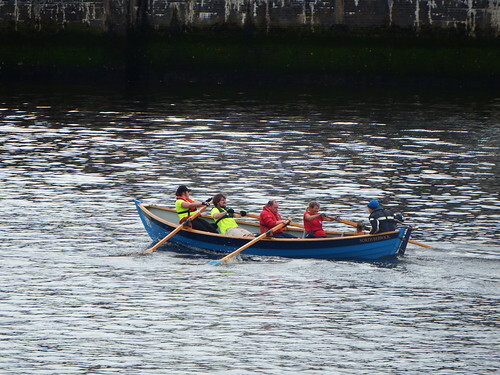 Once again conditions influenced the progress of the rowing. The early tide assistance ran out at about half way and the current changed to the river flow against the racers. So for the same effort speed reduced significantly and coxes had to judge the best line on the river, for least resistance. ‘Blackadder’ (Elisa Robertson/Jo Drewittt/Pete Mileham/Phil Robertson/Finlay Robertson) started just over halfway down through the field and managed to work their way up to 7th place in the Open category, ahead of many of the more fancied entrants. Ahead of them at the start and also working through the field ‘St Baldred’ (Simon Cowan/Rachael Porteous/Richard Budd/Duncan Mackay/Sandy Wallace) managed 5th place in their category. The late starters who were considered the fastest crews of the day ultimately suffered from the changing tide and current conditions and didn’t really ’get going.’ And so it was with ‘Skiff John B’ (Clive Rooney/Duncan Hughes/Ben Lowe/Ian Baird/Alice Everitt) who fell behind in time against clubs they would expect to beat on a normal head to head encounter. 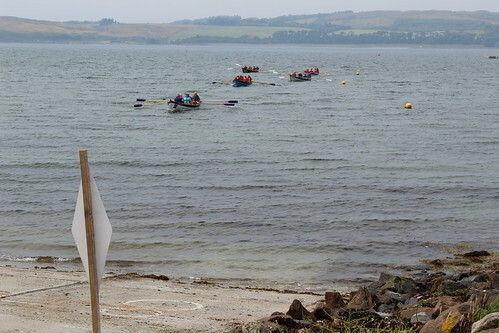 The other four local skiffs managed the course in just a few minutes over two hours and everyone is determined to return and break that barrier next time. A unique aspect of the race is the camaraderie between crews both before during and after the race. It was usual for a cheer to go up between boats as they passed each other and shouts of encouragement to be exchanged no matter how good or bad progress was. After all the crafts had finished there was a trophy ceremony at the Clydebuilt Festival site next to the Riverside Museum. 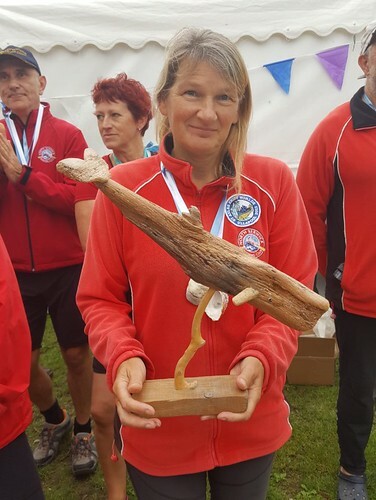 Impressive individual trophies were presented only to the first in each of the various categories and this included the Flossie crew winning the Double Scull category, calculated after a handicap adjustment. The success of this huge event is due to a tremendous team led by Ben Wilde and North Berwick, and presumably, every other club are indebted to them for putting on such a magnificent event. 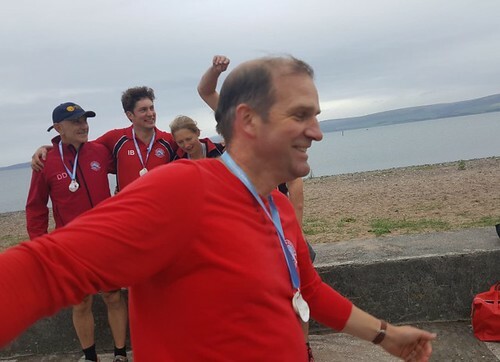 The NB wagon train headed west this weekend to Stranraer to take part in the home clubs regatta and provide the opportunity to test out next years World Championship course. Wagons (or rather tents and mobile homes) were circled on the Friday night at the local reservation and Big John told tall tales round the camp fire of his experiences with the restless natives. The next day it was down to shore and the first view of the course. 15 lanes, 1km out, round the buoy and 1km back. No problem. Other than the other 14 clubs trying to get back before you! The state of the water initially confused the NB rowers as it was ....ummm what’s the word? Flat! What was this sorcery we thought. However we decided against lodging a formal complaint and row anyway. It was soon evident that the quality of the opposition was high and we would have to be on top form to compete for podium spots. It was just as well that we were then! The early races saw the men’s and ladies open as well as the 50+ men all register 2nd places just behind a trio of Irish boats who showed strongly throughout. After a short break for lunch it was back on the water and the strong NB performances continued to come thick and fast. First of all the standout performance (in this authors humble opinion) saw the women’s 50+ storm home in first place. This was followed up by a win for the mixed open crew who showed great resilience by pipping Strangford for gold in a thriller. The mixed decades crew then made it a hat trick of wins leading home Sketrick. Finally the 3rd place finish by our mixed 220+ crew in highly competitive race saw us over the line to win the overall club title ahead of Strangford and Sketrick. A successful day all round with the hospitality and organisation of Stranraer promising a wonderful 2019 World Championship to come next year. 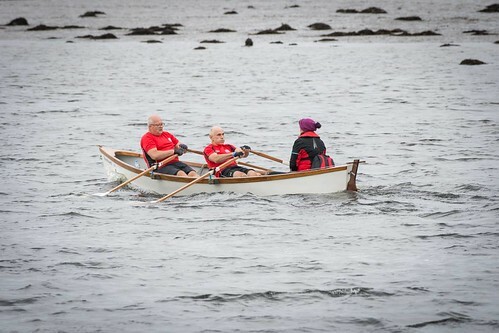 The Largs Annual Regatta was set to be a busy day for the small team of eleven rowers and one bosun who travelled west on Saturday 14 July with seven heats and potentially seven finals as well as a long distance race in memory of Duncan Winning, one of the founders of Firth of Clyde Coastal Rowing Club (FOCCR), scheduled. In glorious sunshine and a breeze which made the sea conditions interesting, North Berwick managed to qualify for every final before lunch. Everybody had rowed at least twice out and back along the 500m course which was actually nearer 1km! Muscles were certainly warmed up. So running a bit behind time the selected long distance cox for North Berwick, Clive (with his cup of tea), gathered his two men and two women for the 3km race. Off the boats went giving those not racing or coxing a welcome rest which turned out to be longer than expected as the 3km race was 6km! Bit of a pattern developing here. To our delight the winning crew of the Duncan Winning Challenge in the Prestwick boat turned out to include our very own Andy. Well done Andy.